Angel Beats! -1st beat-‘s OP&ED singles CD is available for preorder on most sites that sell Japanese music. The official release date is still set for April the 1st and will sell for an MSRP of 1200JPY. In addition to the news about the preorders, we now know all of the tracks on the disc. 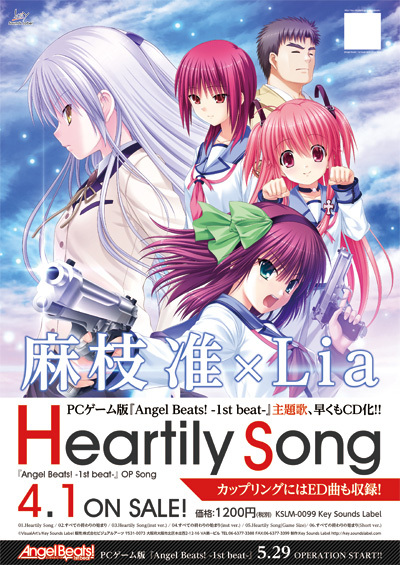 This includes the OP which we know about titled Heartily song which is performed by Lia. The composition and lyrics are by none other than Jun Maeda. For the ED, we now know that Suzuyu will be vocalist for the track titled ‘すべての終わりの始まり’ (‘The Start of the End of It All’ as taken from VGMDB.) Suzuyu is best known for her two performances in Little Busters! Refrain with the OP ‘Boys Be Smile’ and in Little Busters! EX with the ED titled ‘Mezameta Asa ni wa Kimi ga Tonari ni’. She also performed ‘Hisui no Miu’ in Kara no Shoujo. 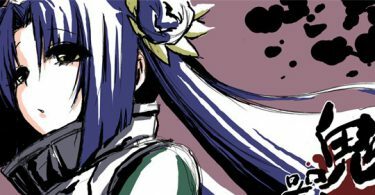 The lyrics are written by Jun Maeda, but Tomohiro Takeshita is in charge of composition. Both of these tracks are arranged by ANANT-GARDE EYES. How many years have passed since the project announced already?